Okay, let’s be completely honest, this isn’t one of the most interesting and engaging books ever written. It is, however, a very iconic piece of literature for many reasons. 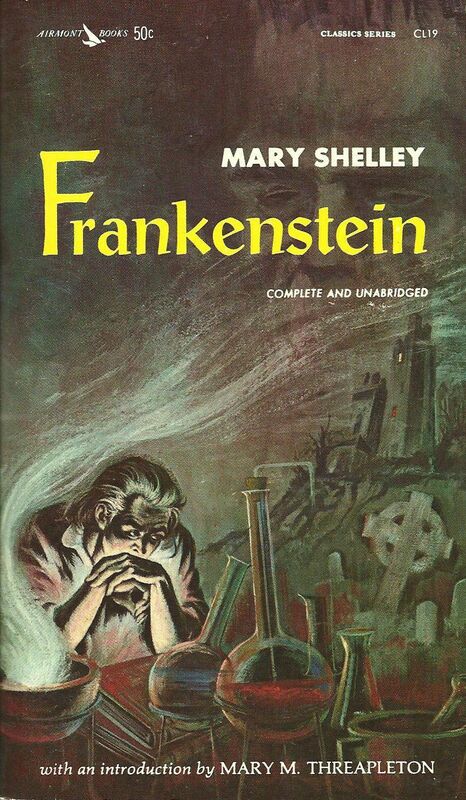 First, Frankenstein was one of the first true “horror” books ever written in this time period. It focused a lot on legitimate science instead of alchemy, which was different from most books in that era. The introduction of the tabula rasa, or blank slate, is also an interesting idea about how society shapes who we are. Perhaps the most interesting aspect, however, is how this book was conceived. Mary Shelley and her friends were stuck inside a house during a rainy day, and decided to read ghost stories. Lord Byron then suggested that they all compete to see who could write the best horror story. This book was subsequently created- Mary Shelley’s first novel- and went on to become one of the most critically acclaimed literary works. Victor Frankenstein wants to defy the laws of nature. He wants to re-gift life to the dead and give the inanimate the chance to live. People say he can’t do it, but he’ll prove them all wrong soon enough. The monster, now in the wild and on the loose wreaks havoc like never seen before. When Victor asks that he stop this unjustified murder, the creature demands that Victor make him a woman so that he is not alone anymore. When Victor attempts to make the creature a mate, he cannot go through with it and destroys the half-created body- right in front of the creature. Nobody is safe from the carnage that follows.